After four days off surrounding the 2010 MLB All-Star Game, the Cincinnati Reds will begin the second-half of their season on Friday night against the Colorado Rockies (49-39, 2nd place in the NL West). During their previous 21 duels, the Reds have only won five games. Bronson Arroyo (9-4, 4.04) will pitch for the Reds on Friday. In his last five starts Arroyo has gone 4-1, allowed eight runs on 25 hits, and struck out eleven batters during 35 innings of work. Against the Colorado Rockies, Arroyo is 1-2 with a 3.98 ERA. When given six or more days of rest, Arroyo is 9-10 with a 4.10 ERA. Hopefully, Arroyo can kick off the second-half of the season with a victory for the Reds and continue his excellence throughout the rest of the season and into the post. After Arroyo and Jason Hammel (7-3, 4.08) face off on Friday night (MC Hammer concert before and after the game), Edinson Volquez will make his 2010 MLB debut against Jorge De La Rosa (3-1, 4.94) on Saturday (Chris Sabo bobblehead night). Following 2009 Tommy John surgery and after serving 50-day suspension, Volquez went 3-0 with a 1.96 ERA in four games for the Louisville Bats. During 23 innings for the Bats, Volquez allowed five earned runs on eleven hits and struck out 21 batters while walking only eight. The 2008 All-Star and 17 game winner's 98mph+ fastball will be a massive addition to the Reds rotation. 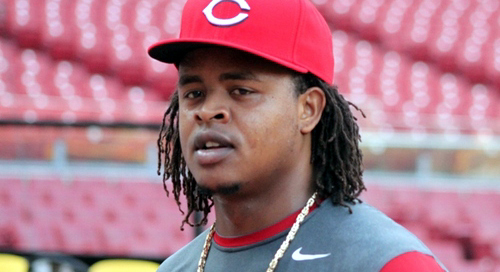 During his 41 career starts with the Reds, Volquez is 21-8 with a 3.44 ERA. The Reds have not yet decided on their starter for Sunday's game against Aaron Cook and the Rockies, but will luckily not have to face the 2010 All-Star Ubaldo Jiminez (15-1, 2.20) during the series. Jimizez's start for the National League during Tuesday's All-Star game took him out of consideration for this weekend's series. I'm sure he was reluctant to face the NL's most productive offense and receive his second loss of the season anyway, so good for him. Another small move to inexpensively improve the Reds depth at Triple-A was made by Walt Jocketty on Thursday. Right-handed reliever Russ Springer signed a minor league deal. Springer has not pitched at any professional level during 2010, but brings 17 major league seasons (36-45, 4.52) worth of experience along with him. Converted to a reliever in 1996 by the Phillies, Springer has played for nine MLB teams including the St. Louis Cardinals ('03, '07-'08) under Mr. Jocketty. “I had him before and he can still pitch,” Jocketty said. Along with Arthur Rhodes, the 41 year-old Springer will add veteran leadership to the Reds bullpen. Nick Masset, Jordan Smith, Logan Ondrusek, and many other young Cincinnati relievers could flourish under Springer's direction. While in Louisville, Springer could also provide assistance to Aroldis Chapman. Walt Jocketty doesn't plan on moving Travis Wood or Matt Maloney to the bullpen just yet, and until Chapman can get himself together (0-1 with a 5.79 ERA in the Bats' pen) he will not wearing a Reds uniform. The signing of Springer is not the Reds' answer to their bullpen problems, but merely a bolster from the past. I can only wonder since Baseball-Reference doesn't list player's fluent languages (lazy bastards); Does Russ Springer speak Spanish?